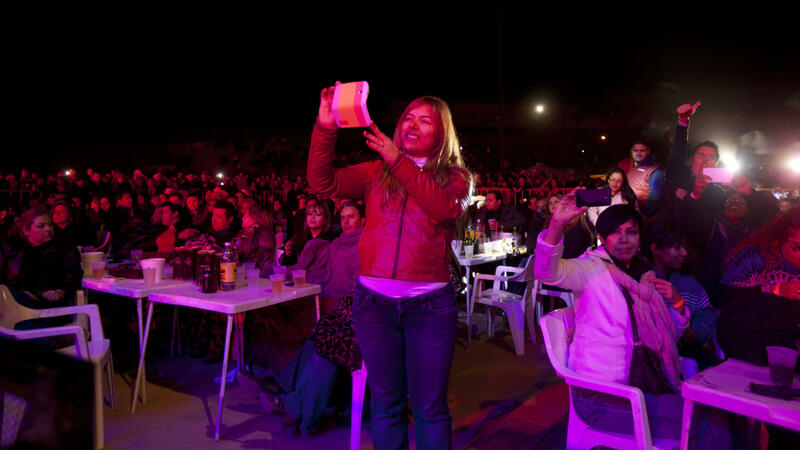 Concertgoers take photos of the band Intocable at a concert in Juarez, Mexico last year. 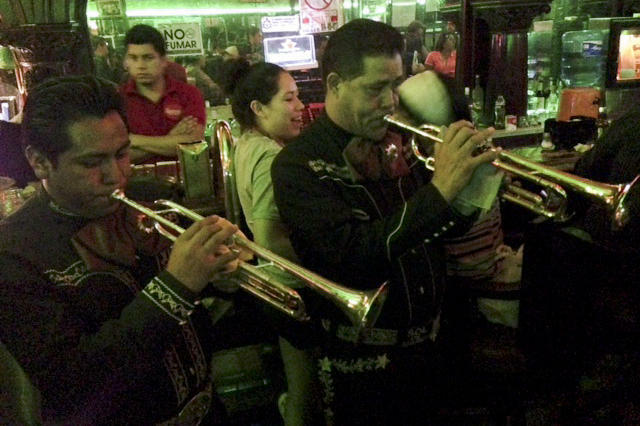 The Mariachi Imperial serenades the crowd at the renowned Kentucky Club in Juarez. Frequented in the past by Marilyn Monroe, Frank Sinatra and a pantheon of Mexican movie stars and boxers, the club managed to stay open during the recent years of violence. In downtown Juarez, Mexico, just across the border from El Paso, Texas, Nelson Armeto and his brothers run a seafood restaurant called Pisces. Like other businesses owners in Juarez, they met with trouble beginning in 2008, when the drug cartels began demanding a monthly extortion fee. "We received calls telling us we had to pay a quota, otherwise we'd get the business burned down, or a car passing by would be shooting up the place," he says. "They even threatened kidnapping us and even sometimes killing the employees." With narcotraficante threats day and night, most people just stopped going out in Juarez. "The fear, the terror, not a soul on the streets," recalls longtime Pisces patron Velia Contreras. The city has suffered decades of violence, as hundreds of women working in factories there were murdered in the 1990s. Then came violent turf wars between drug cartels. At the height of the violence in 2010, the official toll in Juarez was more than 3,000 killings. Many restaurants and clubs closed down or moved across the border to El Paso. The once-thriving nightlife ground to a halt. But now, people are once again partying in Juarez. After a few years of fear, Armeto says, he and his friends became numb to the violence. They decided to start going out on the town like they used to. "YOLO," he says. "You only live once. It's kind of a religion where you go out and each day you live most you can, so if you don't have a memory that day, it's a wasted day." "So let's go," I tell him. This is something I definitely wouldn't have done a few years ago. But with the official death toll down to 434 last year, it seems safer. With Armeto and his party posse, we head out to Avenida Juarez, just blocks from the border crossing. It's now dotted with bars and clubs — some new, others newly reopened. The oldest and most famous, the Kentucky Club, lost business but managed to stay open. Aurora Silva and her band, Mariachi Imperial, are performing covers of hometown favorite Juan Gabriel. The club is so packed we have to squeeze past the band to get to the bar for a margarita, which locals boast was invented here. This is the bar where Marilyn Monroe is said to have famously ordered a round for everyone to celebrate her divorce from Arthur Miller. Frank Sinatra used to party here. So did a lot of famous Mexican movie stars and boxers. Now that Juarez is once again a party town, I bump into Juan Fernandez, a member of Colectivo Wagon, an artist collective. "I don't know if the city's less or more violent," he says. "But what I do know is I'm not afraid anymore. Not afraid of being here, of walking to my house. Probably two or three years ago, it was different." No one can say for sure why violence diminished. There are lots of theories: One cartel gained control. The local police became militarized. The violence just moved on to a different part of Mexico. Next, we head to Tres Mentiras, on another avenue that is once again alive at night. Live bands can only play traditional, brass-based banda music. It's now illegal in the state of Chihuahua for narcocorrido — or drug ballad — bands to go onstage with AK-47s, singing about the exploits of the drug lords. On our way out, we pass a tough-looking private security guard with an automatic rifle, something you see a lot in Juarez. That may be another reason people feel safer going out, though all the weaponry is unnerving. Before the night is over, we hit up four more clubs playing electronica and hip hop. We see teenagers from El Paso, college students from all over the world, and many, like Nelson Armeto and his friends, who just want to party like it's 2007. But Armeto says they do have one fear: getting stopped by the police. Police bribes — the mordida — is a tradition that began long before the narco wars. "They are looking for every minor infraction. I mean, they are going to try to bribe us," he says. "Every time we go out, that's the No. 1 concern we have." People are partying again in Juarez, Mexico, just over the border from El Paso, Texas. Juarez suffered years of horrific violence - hundreds of women working in factories there were murdered in the 1990s. Then came the violent turf wars between drug cartels. The city's once thriving nightlife ground to a halt, but now it is back. NPR's Mandalit del Barco went club hopping and sent this report. MANDALIT DEL BARCO, BYLINE: In downtown Juarez, at a seafood restaurant called Pisces, I meet up with Nelson Armeto. DEL BARCO: Nelson runs the family restaurant with his brothers. Like other business owners in Juarez, they met with trouble beginning in 2008 when the drug cartels began demanding a monthly extortion fee. ARMETO: We receive a call telling us that we had to pay the quota otherwise, you know, we can get the business burnt down, you know, a car, you know, passing by, you know, shooting up the place. Even they threatened to kidnapping us, the business owners, and even sometimes killing the employees. DEL BARCO: With so many narcotraficante threats day and night, most people just stopped going out in Juarez. DEL BARCO: The fear, the terror, not a soul on the streets, recalls longtime Pisces patron Velia Contreras. With the death toll mounting, most restaurants and clubs closed down or moved across the border to El Paso. But after a few years of this, Nelson says he and his friends became numb to the violence. They decided to start going out on the town like they used to. ARMETO: YOLO, you know, you only live once. That's kind of a religion where you really, you know, go out and each day, you know, you live it the most that you can. So if you don't have a memory from that day, it's a wasted day. DEL BARCO: So let's go. DEL BARCO: This is not something I would've done four years ago, but with Nelson and his party posse, we head out to Avenida Juarez, just blocks from the border crossing. It's now dotted with bars and clubs - some new, others newly reopened. The oldest and most famous, the Kentucky Club, lost business, but managed to stay open. AURORA SILVA: (Singing in Spanish). DEL BARCO: Aurora Silva and her Mariachi Imperial are performing covers of hometown favorite Juan Gabriel. The club is so packed we have to squeeze past the band to get to the bar for a margarita. DEL BARCO: Now that Juarez is once again a party town, this where I bump into Juan Fernandez, a member of Colectivo Wagon, an artist collective. FERNANDEZ: I don't know if the city's less or more violent. What I know is I'm not afraid anymore, you know? I'm not afraid of being outside and walking to my house. Probably two or three years ago it was different, but - now probably the city's the same, but I feel different. DEL BARCO: No one can say for sure why the violence diminished. There are lots of theories - one drug cartel gained control. Local police became militarized. The violence just moved on to a different part of Mexico. After taking a selfie outside the Kentucky Club, we head to Tres Mentiras on another avenue that is once again alive at night. Live bands play banda at the Tres Mentiras. It's now illegal for narcocorrido bands to go onstage with AK-47s, singing about the exploits of the drug lords. On our way out, we pass a tough-looking private security guard with an automatic rifle - something you see a lot of in Juarez. That may be another reason people feel safer going out, though all that weaponry is unnerving. DEL BARCO: Before the night's over, we hit up four more clubs playing electronic and hip-hop. We see teenagers from El Paso, college students from all over the world and many, like Nelson and his friends, who just want to party like it's 2007. But Nelson says they do have one fear - getting stopped by the police. ARMETO: They are looking for every minor infraction. I mean, they are going to try to bribe us. Every time we go out, I mean, that's the number one concern that we have. DEL BARCO: Police bribes - the mordida - that's a tradition that began long before the narco wars. Mandalit del Barco, NPR News, Ciudad Juarez, Mexico. Transcript provided by NPR, Copyright NPR.